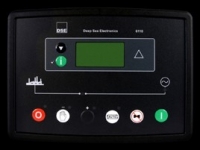 The DSE6110 is an Auto Start Control Module for single gen-set applications. The module has been designed to work with electronic and non electronic engines providing advanced engine monitoring and protection features. The module includes a backlit LCD display which clearly shows the status of the engine at all times. It monitors, speed, frequency, voltage, current, oil pressure, coolant temperature and fuel level. The module has also been designed to display the warning and shutdown status of the engine. The module includes six digital inputs, three analogue inputs and six outputs. Two of the outputs are configurable on the magnetic pick-up version and all six are configurable on the Canbus version. The module can either be programmed using the front panel or by using the DSE Configuration Suite PC software.